Good morning!! Today I'm really excited for our Refashioned Friday segment because I didn't have to travel far to find loads of talent. I just hopped around in our play group this morning and I was so excited to see some of your creative blogs and projects. Here are a few that I love today! This is a shirt turned adorable dress by Krafty Mum. I would have never seen the cuteness potential in that shirt and I love how it turned out! This next project is by Amy over at World Of Mod Podge. 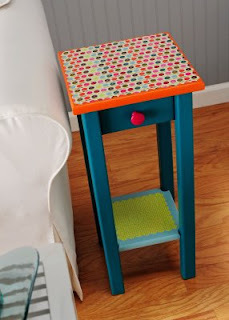 This little side table has so much colorful life after it's makeover! So fun! 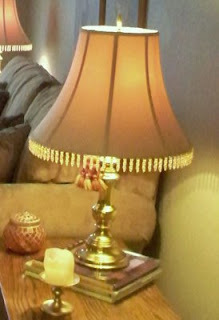 I have to say this lamp refashion really caught my eye! It is so updated and gorgeous! This is by Vanessa at Vanilla Lavender. 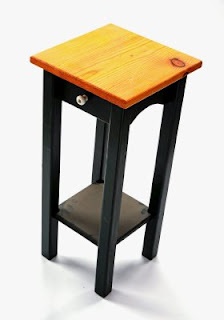 Rachel at The Painted Lady turned this little table into an amazingly elegant piece of furniture! Thanks to all of you ladies who have linked to my blog so I was able to take a peak at your coolness! If you have a project you'd like to have featured on Refashioned Friday please email me a link to a post or before and after pics. poppyginger@gmail.com subject: Refashioned Friday. My favorites are the shirt turned dress and the colorful side table. Thanks for featuring me! I love your blog especially all the redone furniture. Makes me want to get out yard sale hunting to find something fun to redo! I have an award for you at my blog. I love your blog! I love that little dress and the tables!! AdOrAbLe! !